Early detection of metastasis-prone breast cancers and characterization of residual metastatic cancers are important in efforts to improve management of breast cancer. Applications of genome-scale molecular analysis technologies are making these complementary approaches possible by revealing molecular features uniquely associated with metastatic disease. Assays that reveal these molecular features will facilitate development of anatomic, histological and blood-based strategies that may enable detection prior to metastatic spread. Knowledge of these features also will guide development of therapeutic strategies that can be applied when metastatic disease burden is low, thereby increasing the probability of a curative response. Metastatic disease is the major cause of breast cancer mortality and is typically resistant to conventional and experimental therapies. The 5-year survival rate for meta-static breast cancer remains below 25% . It is imperative to develop breast cancer management strategies that are based on detection and treatment before or soon after metastatic spread  in order to improve this situation. Mammographic screening strategies are intended to accomplish this by detecting cancers before metastatic dissemination. Such screening has been successful for both colon  and cervical [4–6] cancers but results for breast cancer are less positive. The widespread introduction of population-based screening breast mammography beginning in the mid 1980s resulted in a dramatic rise in the detection of stage 1 cancers as well as ductal carcinoma in situ. However, treatment of these patients has not resulted in the expected decrease in mortality, indicating that screening breast mammography misses critical lesions until after they have spread . In fact, a recent study of over 40,000 Norwegian women with breast cancer showed that while screening was associated with a 10% reduction in the rate of death from breast cancer, only one-third of this improvement could be attributed directly to screening . Balanced against this modest improvement in overall survival are the dangers of over-treatment with the attending therapy -linked morbidities. This suggests that current screening strategies are not detecting metastasis-prone lesions before metastatic spread has occurred and are detecting many lesions that will not progress to metastatic disease  or may even regress spontaneously . This may be due to lack of sensitivity to metastasis-prone breast cancers and/or progression during the interval between mammographic screenings. Thus, improved screening strategies 'tuned' specifically to detect metastasis-prone cancers are needed that are both more sensitive and sufficiently affordable for frequent use. In the unfortunate event that breast cancer does become metastatic, sensitive and subtype-specific disease detection strategies also may improve outcome by allowing subtype-specific, targeted therapy to begin when recurrent disease burden is smaller. Global analyses of epigenomic, genomic, transcriptional and proteomic (hereafter referred to as 'omic') changes that occur during progression to metastatic disease suggest candidate molecular markers that might be used as the basis for early detection assays. These changes occur during a multi-step process that allows subpopulations of the primary tumor and subsequent disseminated cells to escape their primary site and establish elsewhere . This process may include omic changes that enable mobilization, invasion, angiogenesis, epithelial-to-mesenchymal transition, vascular remodeling, intravasation, immune evasion, extravasation, and organ-specific colonization . In cancer stem cell models, only a small persistent population of cells accrue the necessary mutations and are responsible for relapse and metastasis through a stem-cell-like process of differentiation and self-renewal . In any case, omic studies to date suggest that some breast cancer subtypes are more metastasis-prone than others. For example, basal and luminal B tumors are more likely to progress to metastatic disease than luminal A tumors . This suggests that omic characteristics of metastasis-prone cancers can be used to develop strategies that will detect these aggressive cancers before significant cancer dissemination has occurred. Figure 1 suggests an omic-signature-based screening strategy that we believe will lead to earlier detection of metastasis-prone lesions and to high sensitivity detection of residual disease. An omic-signature refers to a molecular marker or panel of markers, useful for clinical decision making, determined by large-scale measurement at various omic levels, such as the genome (gene and regulatory sequences), epigenome (epigenetic modifications), transcriptome (RNA and gene expression), proteome (protein expression) and others. This is a multi-step screening process in which (a) low-cost blood-based assays of molecular signatures associated with metastasis-prone disease are applied routinely to identify high-risk individuals, (b) more expensive but sensitive and specific anatomic assays are used to localize the lesions, and (c) molecular histopathological omic assays are used to identify and determine the molecular characteristics of even the smallest lesions. The molecular information in individual tumors detected in this way can then be used to develop sensitive blood- or imaging-based 'individualized' assays that might be used to enable early detection and treatment of recurrent disease. Predicting, detecting and monitoring metastatic breast cancer. The figure portrays an omic-signature-based screening strategy for earlier detection of metastasis-prone lesions and high sensitivity detection of residual disease. This strategy is based on the premise that molecular features can be used to define breast cancer subtypes that are at high risk of progressing to metastatic disease. Molecular features associated with metastasis discovered through analysis of metastatic breast cancers are used to develop sensitive assays for disease. 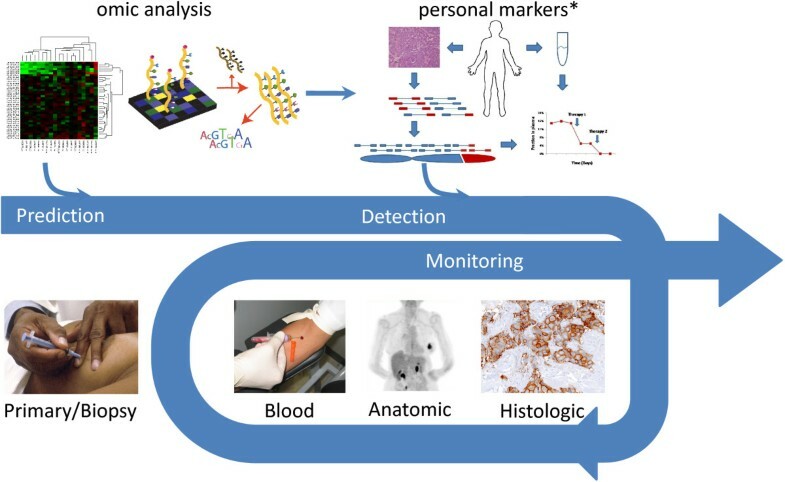 This involves a multi-step process in which low-cost blood-based assays of molecular signatures associated with metastasis-prone disease are applied routinely to identify high-risk individuals who are then screened using more expensive but sensitive and specific anatomic assays followed by histopathological and omic assays to identify and characterize even the smallest lesions. The molecular information in individual tumors detected in this way can then be used to develop sensitive blood or imaging based 'individualized' assays for recurrent disease that might be used to guide early detection and treatment. *Image from  reprinted with permission from AAAS. All other images were obtained from Wikimedia Commons and are available under public domain, Creative Commons Attribution 3.0 Unported license , or Creative Commons Attribution-Share Alike 3.0 Unported license . Development of the strategies outlined above will require an extensive understanding of the molecular features of metastasis-prone breast cancers and of meta-static disease in sites around the body. Breast cancers commonly spread to local lymph nodes, bone, lungs, liver, brain and other sites. Patterns of metastasis may be related to the molecular subtype of the tumor, with estrogen receptor (ER)-positive luminal-like cells spreading preferentially to bone and ER-negative and basal-like tumors preferentially spreading to visceral organs [15, 16]. Many genes have been identified that act as oncogenes or tumor suppressor genes, allowing proliferation, resistance to death signals, angiogenesis, altered cell adhesion and motility . Changes in these genes mediate initiation and local progression of tumors and are prerequisites for metastasis. However, fewer genes have been identified for the subsequent steps of 'metastasis proper' . Genes that act as mediators of metastasis could be activated by many genetic and epigenetic mechanisms. Identifying metastasis-prone breast cancers, detecting residual metastatic cancer early and intervening effectively will likely require a detailed understanding of these specific changes. Discovery of molecular features associated with meta-stasis is increasingly possible through the application of advanced DNA, RNA and protein (omic) analysis technologies that reveal molecular features associated with these aspects of metastasis. Omic characterization of breast cancers has been underway for over a decade and is accelerating as a result of technological advances made during the course of international genome analysis e orts. Initial developments were stimulated by the Human Genome Project [19, 20] and have been accelerated by work in The Cancer Genome Atlas (TCGA) project  and in the International Cancer Genome Consortium (ICGC) . We review here recent progress in elucidating the molecular features of metastatic breast cancer with the idea that this information can be used eventually to guide the development of assays suggested in Figure 1. Much of the e ort to predict outcome in breast cancer (Table 1) has focused on the definition of molecular sub-types, some of which have a high likelihood of progressing to metastasis. Important markers such as ER, progesterone receptor and human epidermal growth factor receptor 2 (HER2) have long been used to predict response to treatment and define important subclasses of breast cancer. Now, omic analyses are leading to multi-gene expression signatures that further define breast cancer subtypes as basal, luminal A, luminal B, normal-like  and claudin-low . These distinct molecular subtypes display different clinical behaviors and outcomes. For example, patients with basal-like breast cancers are prone to more aggressive metastatic relapse whereas patients with luminal A cancers generally have good long-term outcome [23, 25]. The 50-gene PAM50 signature was developed to standardize breast cancer subtyping using a 189 sample training set and was tested in 761 patients receiving no systemic therapy and 133 patients treated with a taxane and anthracycline. These studies showed that the signature also added prognostic and predictive information to standard parameters for patients with breast cancer . Other gene expression signatures, including the genomic grade index (GGI)  and molecular grade index (MGI) , are complementary to histologic grade and have been used to identify additional distinct subtypes in ER-positive disease [28, 29]. The GGI can be used as a predictor of survival and has been associated with response to chemotherapy . ER, estrogen receptor; HER2, human epidermal growth factor receptor 2. Distinct from the purely prognostic signatures discussed above are signatures under development for the prediction of response to specific agents. Oakman and colleagues  have recently reviewed in detail the evidence for single gene markers of drug response. These include the use of HER2 and TOP2A amplification/expression to predict anthracycline response; HER2, protein tau, and P53 to predict response to taxanes; and BRCA1 or the related basal-signature to predict response to DNA damaging agents. Others have reviewed multi-gene signatures for predicting sensitivity to specific agents [44, 45]. Loi and colleagues  developed a 181-gene signature that separates patients based on outcome after adjuvant tamoxifen therapy. An advantage of this signature is that it was clustered in 13 clusters of highly correlated genes from which numerous different 13-gene signatures were evaluated and found to have nearly the same performance as the complete signature. The SET index, a set of 165 genes co-expressed with ER, was shown to predict survival benefit from adjuvant endocrine therapy . This signature was not prognostic in untreated cohorts, indicating that it may specifically predict treatment benefit rather than simply correlate with better outcomes as do some others. The DLDA-30 signature has been shown to be predictive of pathologic complete response after pre-operative treatment with paclitaxel and a combination of fluorouracil, doxorubicin, and cyclophosphamide (T/FAC) with high sensitivity . Validation studies have confirmed the ability of DLDA-30 to identify patients with higher than average sensitivity to T/FAC chemotherapy . However, its performance was not significantly better than clinical variable-based predictors, raising an important metric for success of such signatures. Similar e orts are under-way to develop multi-gene predictors of response to taxanes/anthracyclines , dasatinib , and others. Other signatures may provide more direct information about the biology of metastasis. For example, several gene expression signatures correlated with genomic instability have been found to be independent predictors of poor prognosis and metastasis [52–54]. A 512-gene 'wound signature' associated with the response of fibroblasts to serum across a wide range of anatomic sites  also predicts increased risk of metastasis and death in breast cancer. Other signatures with predictive potential for metastatic phenotype include a 253-gene 'hypoxia' signature  and a 186-gene 'invasion' signature . A 'lung metastasis' signature  is even more directly related to the metastatic process. Serial in vivo selection of a breast cancer cell line (MDA-MB-231) produced a derivative line (LM2) that metastasized readily to the lung in mice. Comparison of the derivative line to the parental line identified a set of 54 differentially expressed genes. Over-expression of nine of these genes, singly and in combination, consistently increased aggressive meta-static activity and some combinations completely re-capitulated aggressiveness of the LM2 line. Bone metastatic activity was not increased, confirming the tissue-specific functions of these genes. Down-regulation by RNA interference in LM2 cells decreased metastatic activity by more than ten-fold. The 54-gene signature distinguished between patients with high risk and low risk of lung metastasis. However, only 18 of the 54 genes were found to be expressed in primary tumors of breast cancer patients. This suggests that detection strategies for metastasis-prone cancers might best focus on genes activated at early stages that are directly involved in metastasis. Detection strategies for metastasis-prone breast cancers may be improved by using genomic information, including copy number, promoter methylation and mutations. Massively parallel sequencing (MPS) projects, including the TCGA and the ICGC, are providing these data [21, 22]. In breast cancer, mutations in BRCA1 and BRCA2 are well established as important in the relatively rare familial breast cancers . Other mutated genes in breast cancer reported in the Catalogue of Somatic Mutations in Cancer (COSMIC) database  include PIK3CA (25% ), TP53 and CDH1 (22%), PTEN (6%), AKT1 (5%) and numerous mutations that occur at frequencies <5%. The roles of these mutations in metastatic progression are mostly unknown, although some are early events that may be useful as markers of residual disease. Importantly, several of these mutations, including in TP53  and BRCA1 , are preferentially associated with the metastasis-prone basal subtype. Early detection strategies based on genomic aberrations will be influenced by when these aberrations occur during evolution and metastasis. The mutational landscape in metastatic breast cancer has only just begun to be elucidated with two key papers recently published. One sequenced DNA from a basal-like primary breast tumor, subsequent brain metastasis, peripheral blood and a xenograft derived from the primary . The second sequenced an ER-positive lobular breast tumor and subsequent pleural effusion . The pleural effusion, collected 9 years after the primary tumor, contained 32 somatic non-synonymous coding mutations, of which 19 were unique to the metastasis, 6 enriched and only 5 prevalent in the primary. No somatic structural changes were identified. In contrast, the brain metastasis, collected less than a year after primary surgery, contained 50 mutations and 41 structural variations, of which only two mutations and a large deletion were unique to the metastasis. Copy number alterations were found to be both increased in number and expanded in metastatic tissue relative to the primary. It is possible that differences in the numbers of metastasis-specific mutations found between the two studies have as much to do with the intrinsic subtypes of the tumors as with timing. Larger studies will be needed to identify recurrent sequence changes relevant to the metastatic process and to determine when these changes occur. If possible, early detection methods should focus on aberrations present in the primary tumor that predispose to metastasis. Projects such as TCGA and ICGC are now providing a wealth of omic information on primary breast tumors [21, 22]. However, analyses of primary/metastasis pairs will take longer as these samples are difficult to acquire and will require special effort. Efforts to chronologically order genomic aberrations may be facilitated by the development of strategies based on the structure of the genome in a single sample rather than by analyzing serial samples. It is likely that no single molecular feature will identify all metastatic lesions. Indeed, the signatures for metastatic basal and luminal subtype cancers may be completely different. In addition, stochastic genetic, environmental and microenvironmental factors may influence the molecular features of metastatic cancers. This suggests that assays for early detection of metastasis-prone cancers must assess multiple omic features. Ultimately, a tiered approach such as that depicted in Figure 1 will likely be needed, with blood-based tests used to identify patients with molecular features putting them at high risk of carrying metastasis-prone lesions followed by sensitive molecular imaging for anatomic localization. Plasma biomarkers are ideal for disease detection because they can be measured inexpensively for the general population to enable early disease detection. However, discovery of highly specific tumor biomarkers in the plasma is hampered by interference from a small number of highly abundant and absorbent proteins (for example, albumin) that make up 99% of the total protein mass in plasma . For this reason, a prioritization step will be required to predict which biomarkers are most likely to be useful for blood-based screening so that enrichment strategies can be developed for these markers (see Box 1 for sample criteria). Candidates must then be validated in plasma-based assays. Traditional assays such as ELISA typically require expensive and time-consuming development for each potential candidate and thus represent an important bottleneck in the discovery pipe-line . New high-throughput methods are being developed to overcome this bottleneck, particularly targeted mass spectrometry (MS) methods such as selected reaction monitoring MS (SRM-MS). These approaches are similar to standard MS but can be 'tuned' to look for specific peptides using knowledge of the expected m/z based on in silico digestion of candidate proteins (for example, those identified as associated with metastasis). Spiking known quantities of isotope-labeled proteins of interest allows quantification of the endogenous protein. Sensitivity can be further improved by enrichment steps with affinity reagents, allowing detection of protein biomarkers down to 100 pg/ml. A further derivation of the method, multiple reaction monitoring MS (MRM-MS), is achieved by monitoring several different SRM transitions within one MS run, allowing simultaneous measurement of multiple proteins or protein isoforms . This method allows multiple low abundance proteins to be quantified simultaneously with excellent accuracy and reproducibility . MRM-MS can even be used to measure phosphorylation stoichiometry and recent proof of principle experiments have measured both phosphorylation and total protein abundance of critical breast cancer biomarkers such as ER and HER2 . Few studies have yet applied these methods specifically to breast cancer metastasis. In one example, however, liquid chromatography MS was used to compare plasma membrane protein abundances between metastatic and non-metastatic breast cancer cells in a mouse model. A total of 1,919 proteins were detected and of these, 13 were differentially expressed. Subsequent validation in clinical breast cancer biopsies found a significant association between high CD73 or integrin β1 and poor outcome . Mining of the metastatic proteome will likely be a critical step in the development of blood-based biomarkers for both prediction of metastatic outcome and monitoring of residual disease and treatment response. Disseminated tumor cells (DTCs) in the bone marrow or lymph nodes or circulating tumor cells (CTCs) in the blood represent other opportunities for early disease detection or recurrence monitoring. Detection typically involves an initial enrichment step, such as gradient centrifugation or immunomagnetic separation, used together with either positive selection for CTCs (for example, by epithelium-specific antibodies such as anti-epithelial cell adhesion molecule (EpCAM)) or by negative depletion of hematopoietic cells (for example, by antibodies against CD45) . Differentiation of DTCs/CTCs is then performed by immunocytochemistry or PCR-based techniques [71, 72]. To date, most commercial systems are based on immunological approaches. These have the advantage of detecting DTCs/CTCs and also providing metrics such as cell size, shape and staining patterns. Primary issues with these assays are relatively low sensitivity and the fact that the epithelial antigens typically used for detection may not be expressed on all tumor cells . Alternative antibodies such as anti-cytokeratins can increase sensitivity  but again may vary between tumors. Molecular PCR-based approaches offer increased sensitivity but are dependent on detection of known mutations, amplifications or methylation patterns. Several studies have shown an association between the presence of DTCs in the bone marrow and metastatic relapse in breast cancer . Approximately 30% of women with primary breast cancer harbor DTCs in their bone marrow even in the absence of overt metastasis and these patients have worse prognosis than those without DTCs detected . The presence of extensive bone metastases has been associated with increased CTC numbers in metastatic breast cancer . A prospective multicenter trial of patients with metastatic breast cancer found that about half of all patients had detectable CTCs using the CellSearch® assay and about 40% were positive using AdnaTest BreastCancer™ . More interestingly, up to half of patients with HER2-negative primary tumors had HER2-positive CTCs. This suggests that HER2 status can change during breast cancer progression or relapse and raises the possibility that monitoring of CTCs for such markers could inform targeted treatment of metastasis. There remains, however, a troublingly poor concordance between CTC assay methods. Development of consistent CTC detection methods and standard HER2 (and other biomarker) assessment methods is still needed. Another challenge is that CTCs can lie dormant for years and have been detected in patients with metastasis-free survival over 20 years after primary diagnosis . Thus, simple detection of CTCs alone may not be sufficient to identify clinically important metastatic disease or determine the correct treatment. Indeed, studies have shown that only a subset of DTCs/CTCs detected are viable and that many are simply terminal or dead tumor cells shed from the primary or metastasis and do not necessarily directly represent metastatic cells (reviewed in ). MPS also holds the promise of personalized and sensitive detection of recurrent disease by measuring the characteristics of circulating tumor DNA. Leary and colleagues  report the use of MPS to screen primary tumors for patient-specific structural rearrangements followed by PCR-based assessment of plasma DNA using primers that flank the aberration breakpoints. This method, termed 'personalized analysis of rearranged ends' (PARE), identified tumor-specific biomarkers that can be used to monitor response to therapy, assess residual disease and/or monitor for relapse. Two breast (along with four colorectal) tumors were analyzed using this approach. At least four somatic rearrangements were confirmed in each tumor (five and fifteen in the two breast tumors). All were unique with no recurring re-arrangements between any of the six tumors. Plasma blood from two of the colorectal cancer patients was assayed by digital PCR analysis and the presence of one rearrangement each was successfully detected. For one patient, blood was available at several time points, allowing the tracking of mutant DNA fraction as it sharply decreased after surgery, rebounded and then decreased again after chemotherapy and removal of metastatic lesions. A small non-zero detection level remained after all treatments, consistent with known residual metastatic disease in the remaining left lobe of the liver. A recent survey of 24 breast cancer genomes by MPS found substantial variation in the number of observed rearrangements from 1 to 231 (median 38) in primaries and 58 to 245 (median 101) in cell lines . This demonstrates the general potential for personalized detection and monitoring of disease by a sensitive and quantitative method. Such methods could ultimately be complemented by equally personalized therapeutic approaches. Recently, the first example of clinical application of whole genome/transcriptome analysis described a MPS analysis of a rare adenocarcinoma of the tongue and subsequent metastases to the lung and skin . The observation of amplification and up-regulation of RET and downstream pathway members was used to inform clinical selection of RET inhibitor therapy with some apparent success. However, such cases remain anecdotal. Detection of breast cancer by molecular imaging techniques has been reviewed extensively elsewhere  but will be discussed briefly here. Proton magnetic resonance spectroscopy (MRS) is one of the most established techniques. While MRI uses the signal from hydrogen protons to form anatomic images, proton MRS uses this information to determine the concentration of metabolites. For example, MRS focused on choline metabolites can be used to detect malignant breast disease at a sensitivity of 80% and specificity of 100% . Imaging methods that focus specifically on detecting metastasis are less common but still plentiful. A recent meta-analysis compared ultrasound, computed tomography, MRI, scintimammography and positron emission tomography (PET) for their abilities to detect breast cancer recurrence or metastasis . For the 42 studies included, ultrasound and MRI had the highest specificity (0.962 and 0.929) and MRI and PET had the best sensitivity (0.950 and 0.953). They concluded that MRI was the most useful supplement to standard surveillance techniques but recommended fluorodeoxyglucose (FDG)-PET for cases where MRI was indeterminate or unavailable. It should be noted that the pooled detection accuracies reported are likely overly optimistic. In most cases the reason for performing imaging was suspicion of recurrence from other indicators; thus, the population was enriched for recurrences. The studies also included local recurrences, which are easier to detect than distant micrometastasis. In any case, this analysis demonstrated a high potential accuracy for detection of breast metastasis by several imaging modalities. The metastasis-prone triple-negative subtype of breast cancer can be detected with high sensitivity using FDG-PET and shows a distinctly enhanced FDG uptake compared to other subtypes . Breast-specific gamma imaging and FDG positron emission mammography show promise in finding small invasive cancers with reported sensitivities of 79 to 96% . MRI can detect lymph node metastasis with excellent specificity (100%) and positive predictive value (100%) . Recent reports have demonstrated that whole-body MRI can be performed in approximately 1 hour and provide 'diagnostically adequate' detection of breast cancer metastases . The study looked at 19 breast cancer patients with known metastases using whole-body, Dixon-based multi-sequence and multiplanar MRI. The procedure was well tolerated by 18 out of 19 patients, took only 69 ± 5 minutes of patient time, and image quality was graded as good to excellent by radiologists. A number of different histologically proven metastases were detected. It remains to be seen whether the method can detect de novo metastasis and whether such detection can actually improve out-comes. However, applying these techniques for assessment of patients at high risk of metastatic disease indicated by blood-based screening methods seems promising. While these imaging methods are getting better at detecting malignant from benign or normal tissues, more work is needed for the detection of micrometastases. Sensitive detection methods targeting the molecular features of metastasis revealed by omic analyses are needed. Biomarkers from metastatic signatures may allow the development of targeted contrast reagents to improve imaging of breast metastasis. Targeted contrast reagents are created by the conjugation of imaging tracer molecules (such as quantum dots, radiotracers, fluorophores, and so on) with affinity-based targeting molecules (such as nucleic acids, proteins, antibodies, anti-body fragments, or engineered affibodies) that target a biological molecule of interest (reviewed in ). In principal, the most attractive features for this purpose are cell surface proteins that are uniquely represented or particularly highly expressed in the metastasis-prone cells. Such agents can be used in conjunction with MRI, PET, X-ray, transmission electron microscopy and other imaging modalities. For example, in mice xenografts, a targeted contrast reagent composed of 18F radiotracer and a HER2 a body was recently shown to allow in vivo monitoring of HER2 expression levels by PET . Similar metastasis-specific agents might someday allow whole-body sensitive detection and monitoring of metastatic lesions. Work in this area is still in the early stages of development but should be effectively guided by the omic analyses described above that are revealing highly expressed cell surface molecules that are associated with metastasis and/or reduced survival duration. Metastatic disease is a major challenge for breast cancer management. Improvements in outcome may come either from improving treatment strategies or by identifying and treating metastasis-prone breast cancers before metastatic dissemination has occurred. The latter strategy is promising since modern omic analysis procedures are now providing molecular descriptors of metastasis-prone cancers. This information should guide development of the required sensitive blood- and imaging-based detection strategies. Sensitive, subtype-specific tumor detection strategies also may allow earlier detection and treatment of recurrent disease. Methods for earlier detection of recurrent disease already exist, but to date there has been no identified benefit of monitoring for distant relapse since metastatic disease remains essentially uncurable. In fact, American Society of Clinical Oncology (ASCO) published guidelines for breast cancer follow-up and management do not include any recommendations for detection/screening beyond history and physical examination . However, detection strategies that identify molecular features that suggest therapies likely to be effective in the screened individual may change the currently dismal situation. In order to be predictive markers for metastasis, the marker must be somehow specific to metastatic cells. This specificity could be a quantitative difference (for example, increase in measurable transcript, protein, and so on) or a qualitative difference (alternative splice form, fusion product, mutation, post-translational modification, and so on). ideal markers would be causally related to some aspect of metastatic progression, therefore serving both as biomarkers and potential therapeutic targets. ideal markers will be highly expressed in metastatic lesions making detection easier. An assay must exist that can (preferably) quantitatively measure the marker. Also, the marker must be accessible to the assay in the blood. Thus, biomarkers that are located on the cell surface or secreted are favored. Markers should be stable in the blood so that infrequent assays will be able to detect their presence. Based purely on stability, this might argue for prioritization of DNA over protein and protein over RNA. Individual markers are not likely to be sufficient. Accurate and sensitive detection may require multi-marker assays and separate assays for different disease subtypes. This work was supported by the Director, Office of Science, Office of Biological and Environmental Research, of the US Department of Energy under contract number DE-AC02-05CH11231, by the Department of the Army, award W81XWH-07-1-0663, the National Institutes of Health, National Cancer Institute grants P50 CA 58207, the U24 CA 126477, and the Canadian Institutes of Health Research. The content of the information does not necessarily reflect the position or the policy of the Government, and no official endorsement should be inferred. Joe Gray serves on Scientific Advisory Boards for Agendia, Cepheid, KromaTiD and New Leaf ventures.